"A joy shared is a joy doubled"
I must admit that I wish I had come up with this quote myself for I find it to be the basis of all the things that I do and enjoy. There is, of course, a certain magic being alone, one with the stars above. It makes no matter if they're real or generated by machine. They are magic, and the magic doubles when we share. I imagine that each of us, no mater what we do, feels the same way. A chef for instance, not only enjoys the art of cooking (as well as partaking in the results of that art [ah, I wish I didn't enjoy partaking of that particular art so much]) but also truly enjoys others enjoyment when they partake in the fruits of his labors. We enjoy dots of light. Dots that represent just part, the parts we can see, of this infinite, mind numbing, universe we live in. And that part might not even exist any longer, for we see light that was generated millennia ago. I have shared this wonder with my family and enjoyed it again just watching their faces, answering their questions, and getting them thinking. Building planetariums and observatories is just one side of this strange obsession. Problems and solutions come from trial and error and finding good folks on forums such as this to help us on our way. The flip side of this "coin" is the sharing. But how? Enthusiasm takes us so far. What really works and what needs to be taught is part of the responsibility of sharing this love we have for the night sky. If anyone had told me a week ago that this forum would be here and that I would be administrating a forum on home planetariums, I would have thought them "nuts". But strange things happen to strange people and no one is stranger then I am. What was impossible just a few days ago is now history. What more could happen in this insane week. Dr. Sanchez has joined us. There are those out there that would say having a gentlemen of his caliber with us "legitimizes" out efforts. That and that alone will hopefully encourage others to join us. I offer a very large "xosmos" welcome and hope that we will be worth his time. Dr. Sanchez, welcome to out little forum and thank you for coming. I would love to get your perspective on what works and what doesn't when teaching groups of all ages about the magic that is our universe. Someone once opined that what our sport really needs is a bunch of proselyting blokes with fire in their bellies. Most amateur astronomers I know would never fit this profile. But Me?----My "inner-fire" often ignites when I forget to take my Prilosec. Heres an interesting thread thats a year old but just came up elsewhere. i hereby name this .. umm. the EEW ratio.. Likert Scale is already taken . but we can invent our own terms.. 'dome pergatory' i lay claim to .. ron lays claims to 'good junk' ... we are inventing the art and science of Home Planetariums, or defining and collecting it are we not? we are the founding fathers - (well Pat Dobbins is a founding mother) .. there arent that many of us .. we have but a few 'good ancestors'.. so i'll claim this ratio.. wait .. the WEE ratio! the WEE ratio... WOW vs education vs entertainment ..
Wild Enthusiastic Expression = WOW vs Education vs Entertainment. That would be the Wee-Wee factor. But all seriousness aside, I'm glad this thread has been resurrected. I think that I would like my ratio to be something like 20/50/30, but knowing how little I really know about the subject I will probably be more like 20/20/60. The old adage "baffle them with BS" comes to mind, not that I want to but, with the little I really know, I will just brush the edges of the subject and hope the viewers be excited enough to continue researching this fantastic science. I would love to increase the W factor but am not sure that my meager attempts will hold a candle to the likes or Chronos and Zeiss. Now, I suppose you can mark this on a curve and factor in what the audience has ever seen before and then, perhaps, we can skew the numbers to more like 30/20/30 which would make me feel better at least. As I said somewhere before, getting some of those "gasps" from people would sure make me feel good and, I believe, make my presentations all the better. Since were talking a bit about the education factor, what subjects would any of you like or expect from a planetarium experience? Hey where did that extra 20 go! But seriously, There are plenty of Folks like me that have never seen one of these machines work. So I believe you will get the effect you want Ron! there are NO facilities in my theater ron, you have to go out back where there is 4 acres of woods! The correct numbers should be:45/22/33. Actually, I'm looking for a large WOW as that does me as much good as them, and if I can keep up the big WOW factor they might not notice my ignorance on the subject matter at hand. i still have yet to write that WHEE article ..
what would be most accurate? perhaps some of the other board astronomers can jump in. gare doesn't really 'know' astronomy! It's interesting how you come up with an idea and then find it has been touched upon before. I was thinking to myself just how technical a show should become. I'm not all that knowledgeable but I know the difference between a main sequence star and a red giant but I'm beginning to wonder if I'm going overboard. Perhaps it should be just fun and just touch on things. What have you guys done and how technical do you get? Is it better to just keep it light??? 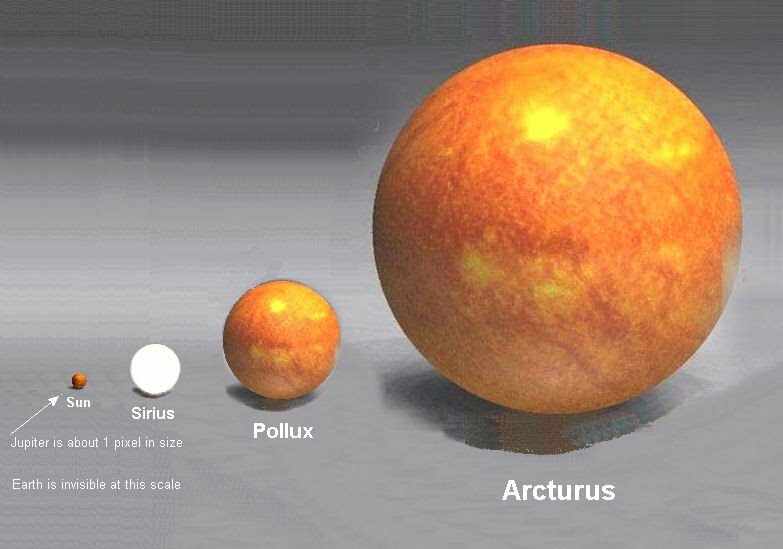 There are red dwarfs and red giants, as there are white dwarfs and blue/white giants. "yellow" stars are considered right in the middle, masswise. Most stars are classified according to their position on the main sequence of the H-R (Hertzprung-Russell) Diagram. Blue giants are massive, main sequence stars, that are undergoing hydrogen fusion at a faster rate than any other main sequence star. For this reason, they are relatively short lived/high temperature stars, hence the blue/white color. Likewise, yellow stars are also main sequence stars that are hydrogen fusing stars. A red giant star is not a main sequence star. It is a star that is in the twilight of its years, that is, it is a star that is no longer fusing hydrogen in its core. So, gravitational contraction causes the temperature in its helium core to rise to at least 100 million Kelvin (This is where we get carbon, by the way). There is still hydrogen fusing in a shell around the core which causes the star to expand. This expansion cools the star, therefore, the surface temperature goes down, and we perceive this decrease in temperature as a red color. 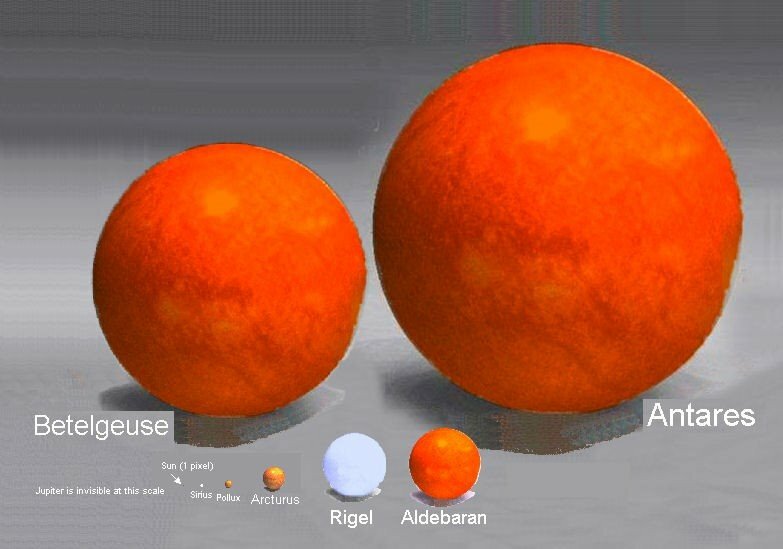 Red giants have the same mass as a main sequence star, but occupy a much larger volume, so they are less dense as well. A white dwarf is the core of a star of mass similar to our sun after it has thrown off its hydrogen envelope into space (Post red giant phase). This creates what is called a planetary nebula. The core of the star at this point is mostly carbon, and it has a high density. As long as the core is not part of a binary system, it will no longer undergo fusion and will cool to a red/brown dwarf. Eventually, the core will cool enough to no longer emit EM radiation at visible wavelengths, becoming what is called a "dead black dwarf"
When our Sun's core runs out of hydrogen in the core for fusion in about 4.5 billion years, it will expand to a red giant. Our Earth's orbit will, at that point, be inside the sun. The apparent scale of this change will be roughly equivalent to a marble to a large beach ball. I like that projector a lot. I can see that when I finish my main projector (if I ever finish) I will have to build some of these smaller units. I guess our work is never done. How many more of these gems do you have? Not many, but here is another one I received from Holt Planetarium that I like alot. It is a solar eclipse projector. The second projector projects the sun and has a motor drive to slowly place the moon in front of the sun, and then the first projector projects the suns corona. All under push button and rheostat control.... I think its neat. I believe this one was made by Walker Instruments who produced a lot of planetarium auxillary projectors. Yes, we have, aah....I mean....no not me, unfortunately. Nice unit. That is definitely one of the things that needs to be reproduced in the planetarium. I have a "sort of eclipse" projector. Its basically a large bright disk that gets overtaken when a motor driven opaque disk moves in front of it. When coverage is complete, I project a slide image of a total eclipse on that spot (via a separate switch). They are the same size on the dome, so, it "works"
Ever have a 'eureka' moment, when a subject thats fascinated you all your life suddenly reveals how little you actually know about it? I was just reading a dollar store book on the PLANETS when I read .. solar system .. that venus rotates backwards? to the west and not the east? Knowing NOTHING else about the planets, one could show how they rotate. Uranus is the one sideways right? I call it a "TERROR" moment! I could probably get through any program as long as nobody asked any questions. My understanding of all this is not very deep as well. We must go forth however and "do" otherwise what's it all for? Any good book on astronomy will give you all the info you could possibly need for your talk. The problem comes for me when I plan what to put on the dome when I do the talk. The simplest thing would be to have slides of the various planets that could be faded up when the time came. In this day and age this would probably not be enough. This is one of the reasons I like the idea of adding a mirror all dome projector. One could start with just a small video projector or possibly even a small TV with a lens in the front of it. The image would not have to be very bright as we don't want the audience to lose their dark adaption. I found a great program called "Seeker" by bisque.com the same people that make "The Sky" software. It contains actual pictures as well as great artwork of the various planets and allow you to move about them in real time. You can even make a trip and save it as a quick time movie for playback during a show. Talking about a planet with a beautiful image to look at and even with its moons moving about add a bit of that special effect that would be very effective at a presentation. What I find is the apparent lack of interest in what I plan to offer. I am to the point where I could go out with my portable system and have been "feeling things out" and the interest is tepid at best. You can bring the water to them but you still can't make them drink. You can't even get them to give you a place to put the bucket. It won't stop me, but it sure tends to slow me down a bit. 10. It was discovered that the Milky Way is in fact a barred spiral, the bar is 27 million light years long and is at a 45 degree angle to a line from our sun to the center, we are NOT a typical spiral galaxy! How did they do it? Infrared with the Spitzer. 9. Discovery of the Great Attractor, the whole Virgo Supercluster of galaxy (of which our local group is a small outlying part) is steaming towards a spot in the constellation Norma, which apparently marks the location of a massive supercluster of galaxies. 7. The Milky Way apparently gobbles up smaller galaxies, and some globular clusters may actually be old nuclei of gobbled up dwarves - the most notable new discovery of a gobbled galaxy is a dwarf in Saggitarius - the Milky Way is hungry! 4. the big bang appeared too perfect - no fluctuations in the background hiss .. flat geometry .. somehow Guth at MIT developed a model that allowed a tiny period after the big bang where all matter was in contact, then the same probe that had dated the big bang at 13.7 million years ago confirmed 'inflation'... I have no idea what they are talking about on this one! Wow, that IS deep stuff. I think I'll stick to the simple stuff like constilation folklore and what's up in the sky this month. The heavy duty stuff can be saved for the classroom. I think the Dark Force stuff is examining aspects of the expansion of the universe, but its an interesting reversal of Oblers Paradox, which I dimly remember saying that as light sources are everywhere in the sky, why isnt the sky a blinding sheet of light. Now they are saying, the sky will go dark completely as things recede. Pioneer 11 launched April 73, Jupiter bounced it toward Saturn in Dec 74, and Saturn threw it out of the solar system in Sept 79. It is current 75 au from the sun, going 2.4 au per year. It is headed into Aquila (lambda) in about 4 million years. this anomoly cannot be tested with the voyagers, as they jet gas periodically to stabililze. green: theres a green star somewhere, ??? I love those kind of exhibits. Do you remember the "Electric Theater" at the Museum of Science and Industry in Chicago? When you entered and turned right and went through the time, telephone, sound exhibits all the way to the end and then down into the basement. There was a huge electromagnetic spectrum above the stage that they lit up as they talked about the different wavelengths. Popping an ear of corn and lighting a fluorescent lamp without wires were highlights but I also remember them lighting the smallest (a grain of wheat bulb) and the largest (a 10KW bulb) bulb. These are the things that stick with people long after the show is over. I can see a black light painting of a galaxy and then a grain of wheat bulb hidden within to be a super-nova. One of the great things with the Adler were the exhibits that surrounded the star theater. They kept everything dark to dark adapt ones eyes for the star show. Your lucky to have the extra room to set some of these things up outside the dome. I wish I could afford the room. We speak of one bulb to depict heavens myriad stars, but we can also use one bulb per star and therefore simulate the color, the variety, the singular magnificience to accompany our starry sky multitude effect. Owen .. you present the ultimate challenge, how to see natures greatest beacons the supernovae. This is a subject that intrigues beyond this exhibit, blinding to be sure! Ron, memories flood in of that museum in Chicago. The electric theater I had forgotten, was it down past the picture phones, the whisper chamber etc? I dimly remember a 'gaslight' street from the 20s. Autorama .. a nuclear reactor you walked inside .. Yes, past the whisper chamber. I had forgotten the gaslight street and the reactor but I think they were down a different hall. Remember the walk through heart, the steel mill, the coal mine. Wow, what a great museum. It is always wonderful to see one of your ideas come to life. This group, perhaps more than most other groups, often sees ones words turn into projects and eventually become a reality. I think your dedication and creativity needs to be not only respected but commended....carry on. Owen, we were in Paducah yesterday at Hobby Lobby and Ive added three letters to my own DREAM sign, check it out! The Golden Gate Bridge model and the Bolder Dam model that filled with water. no visits yet, i need two more years! I heard that MM! When we shopped for a farm, the ONLY requirement I had was a barn out back, the house didnt matter! Barns were always multipurpose anyway if you think about it, farm equipment, animals, feed, hay. Now after 24 years, I go 'shopping in the barn' first. If I need a 2 by 4, I find one nailed up for example in 1986 when my band briefly played in the loft, or one still on the floor from my office in the back that I had till about 95, which briefly had a second 9 foot dome built the week the smith cylinder came home (torn down 4 months later). There are remnants in the rafters of halloween parties from the mid 80s .. The area my music stuff is in now was once the lowest level of the 'nightclub' era, where we joked our drummers friends liked to sit. Then for 10 years it was a glass studio where stained glass was done. A barn can morph along with our lives. And as a slide once said, lean tos are very american - once you have a structure, its a wall for MORE structures! Are you serious about the two years? It's on my to-do list for 2010. What worries me is that two years can drag out into even more. Actually I NEED someone to visit Ken, unless I draw a finish line you are right, I'll just keep doing laps! As I thought about projecting or 'brute forcing' the moon in my planetarium sky, I vaguely remembered 'its smaller than it looks'! Indeed - 10 full moons between the pointer stars of the big dipper! Can you share your Egyptian module? Having spent time there, made friends there, and explored the temples, tombs, and museums, Egypt has a special connection for me.